I first heard the term “discharge before noon” (DCBN) as a third-year medical student starting my internal medicine rotation. The basic idea made sense: get patients out of the hospital early so rooms can be cleaned more quickly and new patients wouldn’t have to wait so long in the ER. It quickly became apparent, however, that a lot of moving parts had to align perfectly for DCB N. Even if we prioritized rounding on dischargeable patients (starting 8-9 a.m. depending on the service/day), they still needed prescriptions filled, normal clothes to wear, and a way to get home, which wasn’t easy to coordinate while we were still trying to see all the other patients. Fast forward through 5 years of residency/fellowship experience, DCBN seems even more unrealistic in hospitalized pediatric patients. As a simple example, discharge criteria for dehydration (one of the most common reasons for pediatric hospitalization) includes demonstrating the ability to drink enough liquids to stay hydrated. Who’s going to force children to stay up all night sipping fluids (plus changing all those diapers or taking them to the bathroom)? If the child stays on IV fluids overnight, we have to monitor at least through breakfast, likely lunch, thus making DCBN nearly impossible. 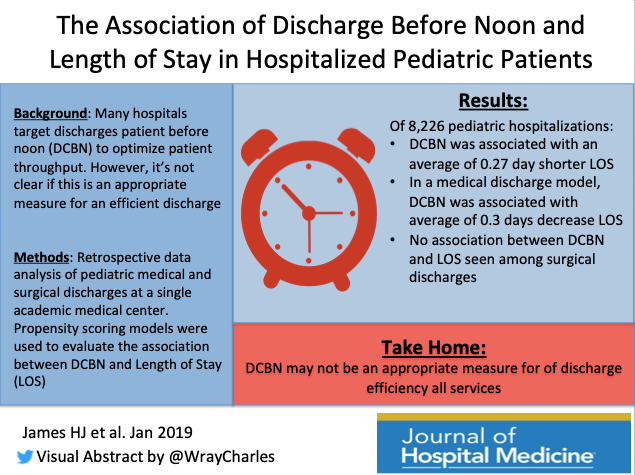 In this month’s #JHMChat featured article, Hailey James (@Haileyjms) et al demonstrated an association between DCBN and decreased length of stay (LOS) for medical but not surgical pediatric discharges. This made them question if DCBN is an appropriate metric for discharge efficiency, as well as workflow differences between services. However, many hospitals still try to push DCBN as a goal (see Destino et al in the same January 2019 issue of the Journal of Hospital Medicine), which could potentially lead to people trying to game the system. How does your institution try to make discharge processes more efficient? Is it actually possible to do everything more quickly without sacrificing quality or trainee education? 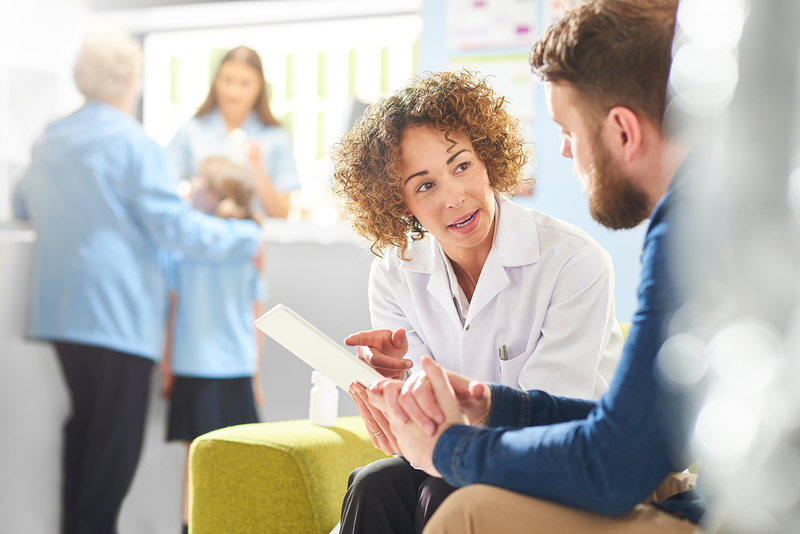 Whether your patients are kids, adults, or both, there are likely many issues in common where we could all learn from each other. Join us for #JHMChat on Monday, April 15 at 9 p.m. ET/6 p.m. PT! New to Twitter or not familiar with #JHMChat? Since October 2015, JHM has reviewed and discussed dozens of articles spanning a wide variety of topics related to caring for hospitalized patients. All are welcome to join, including medical students, residents, nurses, practicing hospitalists, and more. It’s a great opportunity to virtually meet and learn from others while earning free CME. To participate, type #JHMChat in the search box on the top right corner of your Twitter homepage, click on the “Latest” tab at the top left to see the most recent tweets, and join the conversation (don’t forget the hashtag)! Dr. Jennifer K. Chen is currently a pediatric hospital medicine fellow at Rady Children’s Hospital/UC San Diego. She completed medical school at the New York University School of Medicine and residency at Children’s Hospital Los Angeles. Dr. Chen’s research interests include care of children with complex medical needs and social media in medical education. 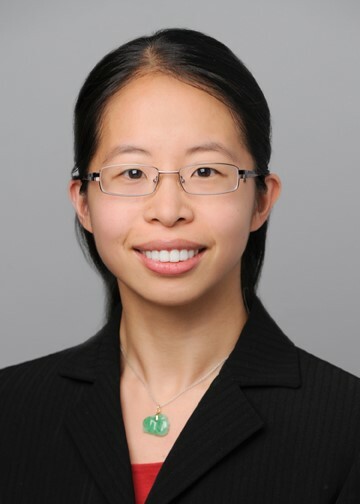 She is one of the co-founders/moderators of #PHMFellowJC, serves as a fellow district representative for the American Academy of Pediatrics, and is an active #tweetiatrician at @DrJenChen4kids.